Daniel W. Barefoot’s colleagues in the North Carolina General Assembly call him their “resident historian.” Now, he’s their resident folklorist, too. North Carolina’s Haunted Hundred, Barefoot’s three-volume series, is a sampler of the diverse supernatural history of the Tar Heel State. One story is drawn from each of the state’s hundred counties. You’ll find tales of ghosts, witches, demons, spook lights, unidentified flying objects, unexplained phenomena, and more. Many of the stories have never before been widely circulated in print. 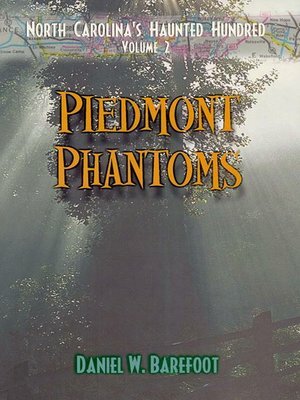 Piedmont Phantoms offers 40 tales from the state’s populous midsection. “Capitol Haunts,” the Wake County story, tells of strange doings at the State Capitol—an unoccupied elevator moving from floor to floor, an unseen hand touching a security guard, the sounds of books falling off shelves and barrels rolling down stairs. “Ghostly Legacy of the Swamp Fox,” the Robeson County story, introduces the spirits of the traitor who betrayed Revolutionary War general Francis Marion and the Highland Scot girl who made him do it. “The Hunter at the Zoo,” the Randolph County story, describes the ghost of the Confederate recruiter who once hunted human prey at what is now North Carolina Zoological Park. This entry was posted in eBook Friday and tagged fiction, folklore, North Carolina. Bookmark the permalink.